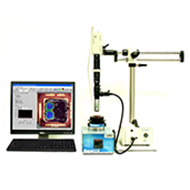 thermVIEW™ is a Thermochromic Liquid Crystal based temperature measurement system that performs high-resolution thermography with precise temperature accuracy and micron level spatial resolution. thermVIEW™ is the most cost-effective and accurate die level thermography system available on the market. Applications for thermVIEW™ exist in a wide range of industries, including electronics thermal management and failure analysis, gas turbine heat transfer industries and academic laboratories. The thermVIEW™ system uses the color response of thermochromic liquid crystals (TLC) for the purpose of temperature measurement. Liquid crystals reflect incident light at the visible wave length based on the temperature of the surface to which they are applied. The temperature response of liquid crystal is called the event temperature. When the surface is illuminated by white light and viewed under fixed optical conditions, the TLC material will reflect a unique wavelength distribution of visible light (i.e., color). As the temperature rises through the TLC’s bandwidth, the reflected color of the TLC will change. When the temperature exceeds the TLC’s clearing point temperature, the material will enter the pure liquid state and will revert back to being transparent. thermVIEW™ built-in features allow fully automatic color-temperature calibration of virtually any TLC formulation available via the patented RS-232-enabled calibration device. This device permits the color-calibration data to be acquired by simultaneously using the camera to record the color response while it is being subjected to successively higher levels of temperature on a solid-state, PID controlled test surface. The software then analyzes the color/temperature response and builds the calibration data. The technology and performance of thermVIEW™ surpasses all other available methods, including Infra Red thermography.